Bust 31.5-36", Waist 24-28", Hips 33.5-38"
2011 Reproduction, Retro Rockabilly Daytime Clothing Patterns - MISSES' DRESS AND BELT: Mid-calf dresses A, B, C have close-fitting, self-lined bodice with side front and back seams, flared skirt with side pockets, back pleats and zipper. A: below-elbow sleeves. A, B: bodice back extends into tie ends. B, C: short sleeves. C: bodice back extends into band with button and buttonhole. Purchased petticoat. 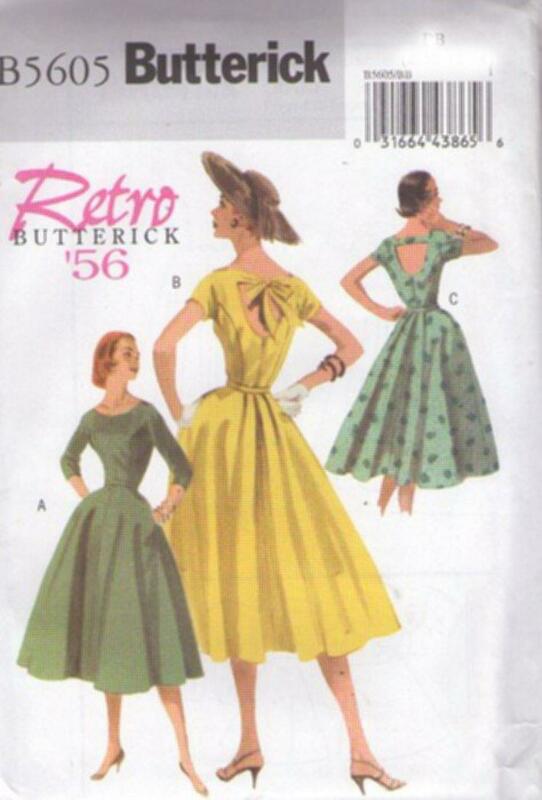 Based on an original 1956 design and no longer available at Butterick.